Hereditary hemochromatosis (HH) is the most frequent genetic disorder in Caucasians, which affects about 1 in 1000 people in the Northern European ancestry. It is an iron overload disease with typical clinical symptoms resulting from excess body iron. In particular, severe symptoms manifest in the liver, representing the main storage site for iron. Too much iron can be toxic which is related to its capacity to catalyze reactive oxygen species (ROS) formation via the Fenton reaction. In high concentrations, these chemically reactive metabolic products provoke significant damage to cell structures and tissues. In the liver, ROS also participate in inflammatory, metabolic and proliferative disease inducing fibrosis, cirrhosis and hepatocellular carcinoma. Fig. 1. Schematic representation of the LA-ICP-MS workflow for metal imaging in hemochromatosis. Metal imaging in hepatic biopsies requires several work steps. After liver biopsy (A), a cryosection is prepared (B) suitable for LA-ICP-MS measurement (C). Measured metal concentrations are calculated (D) and colorful image maps from the different metals (E) prepared. In addition, the sections are documented by pictures obtained by light microscopy (LM). These images provide information for example about precise iron concentration and distribution within the liver tissue. Based on given reference values, it further can be used to determine whether a patient has “iron overload” or not. For more details, see Kim et al., BMC Imaging 2018. Therefore, accurate quantification of hepatic iron content by histological grading of stainable iron, quantitative chemical determination of iron, analysis of serum biomarkers associated with iron overload, or imaging procedures in patients genetically tested for HH are important to avoid clinical complications. However, these standard techniques have some limitations. Protocols used for chemical iron measurements in ashed liver tissue are rather time-consuming and prone to sample loss and contamination. In addition, they are potentially dangerous for the laboratory staff because of the release of hazardous fumes during the ashing process. Likewise, determination of iron in histological stains is often erroneous because iron values are artificially lowered by removal of iron from the tissue during fixing, washing and staining steps in the histochemical procedure. Moreover, quantification of liver iron by non-invasive imaging techniques such as magnetic resonance, computed tomography are partially limited in HH patients when their livers are rich in fat, or simultaneously affected by inflammation and fibrosis. Moreover, the correlation of hepatic iron content and biochemical parameters in the serum is often poor in HH patients. 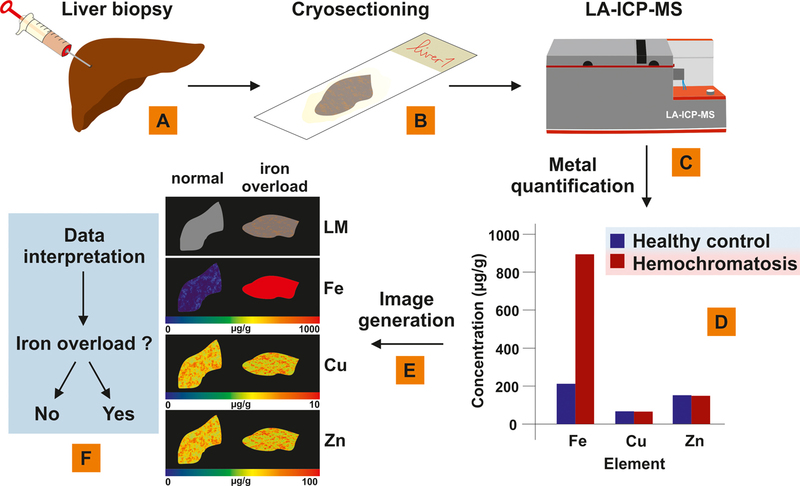 We have recently established novel laser ablation inductively coupled plasma mass spectrometry (LA-ICP-MS) protocols for hepatic metal bio-imaging for diagnosis of iron overload (Fig. 1). In brief, a thin cyrosection is prepared from the routinely sampled liver biopsy. This specimen is then placed into a laser ablation device, in which a finely focused laser ablated biological material continuously while moving in the x-direction. The ablated material is then transported by an inert carrier gas stream into a special mass spectrometer (ICP-MS), which is capable of detecting metals at concentrations as low as one part per quadrillion. After finishing the scan of the first line, the laser is slightly repositioned in y-direction and performs the next ablations. This “line-by-line scan” enables to determine the iron concentration with spatial resolution and further allows simultaneous measurement of various other metals characterized by other mass-to-charge ratios. Using well-automated software routines, the content of individual elements are then converted in colored and easy to interpret element maps. In conclusion, this methodology is an important add-on to routine diagnosis of iron overload in HH patients. The protocols can be adapted to all kinds of other biological materials in which metals should be quantified with spatial resolution. Quantification of liver iron overload disease with laser ablation inductively coupled plasma mass spectrometry.